This product is now obsolete and has been replaced by the Altair 4x Multigas Detector. The ALTAIR 4 is a reliable multi-gas detector that measures O2, H2S, CO and combustible gas. Besides being one of the most compact multi-gas detectors available, it has an extremly durable rubberized housing and is very easy to use. 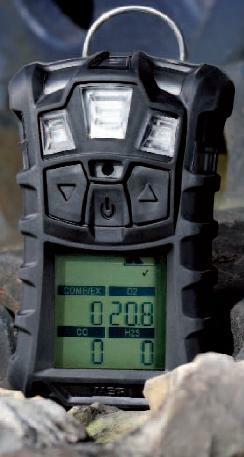 The ALTAIR 4 is available with the option of MotionAlert - a unique feature in the world of portable gas detection. The detector's alarm is triggered if the user remains motionless, alerting those nearby. The InstantAlert alarm allows the user to manually activate the detector's alarm system. It is a standard feature across the ALTAIR 4 range. Triple Alarm System: super-bright LEDs on the detector's top and bottom, audible alarm of 95 dB at 30 cm and strong vibrating alarm as a standard.